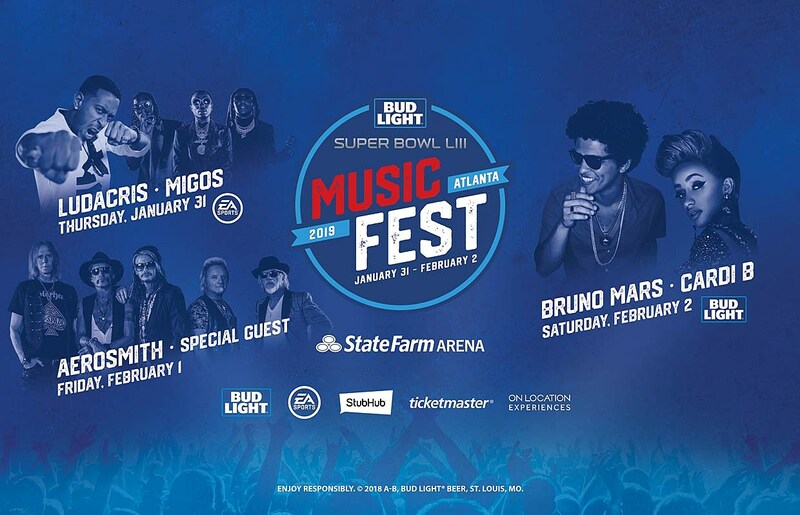 Maroon 5 are playing the 2019 Super Bowl Halftime show (maybe because better artists turned down offers in solidarity with Colin Kaepernick), but in more exciting news, there will be a three-day music festival in Atlanta (where the game is happening) leading up to the Super Bowl. It’s called the Bud Light Super Bowl Music Festival and it happens January 31 – February 2. Day one includes the all-Atlanta lineup of Ludacris, Migos, Lil Yachty, Lil Baby, Metro Boomin, and a Lil Jon DJ set; day two has Aerosmith; and day three has “Finesse” collaborators Bruno Mars and Cardi B, who were supposed to tour together this year until Cardi had to drop off due to giving birth. With Cardi performing in Atlanta the day before the big game, this makes the rumor that she’ll perform with her “Girls Like You” collaborators Maroon 5 during the Halftime Show seem even more likely. Tickets go on sale Friday (11/9) at noon.